Although at one time there were flower beds in the Gardens, what remains largely consists of trees and shrubs. Planting, removal and replacement has occurred throughout the life of the Gardens. Although many of the tree and shrub species are the same, only a few of the trees probably date to the original plantings. Oaks and plane trees were planted between 1875 and 1900, although no plane trees now remain. An avenue of poplars parallel to Mollison St appears on the oldest photos and perhaps date to 1871, but most of the trees have been replaced at various times (due to disease, or when Mollison St was widened into the Calder Highway). A hedge of 1500 hawthorns was planted along the south-east boundary in 1877 (a hawthorn hedge still exists along the border facing the railway embankment; at that time, 200 Eucalyptus globulus (Tasmanian Blue Gums) were also ordered. A substantial number of trees were removed in the 1920s-1940s and more were planted. Most of the pines in the pinetum probably date from that period (an aerial photo from 1946 shows that the pine canopies did not overlap then). More removals and plantings were made as part of the rejuvenation program in 1985 and the program of identifying senescent or dangerous trees and replacements will continue. There are so many fine trees in the Gardens that it is difficult to single out particular ones for comment. 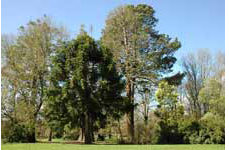 Two Bunya Pines (Araucaria bidwillii) near the tennis courts are listed by the National Trust as having regional significance and are probably over 100 years old. An Arbutus x andrachnoides was also listed as having State significance, but it was badly damaged by a storm in 1997 and is slowly resprouting from the base. The single specimens of Crataegus coccinioides (a North American hawthorn), Sequoia sempervirens (California redwood) and Picea smithiana (West Himalayas Spruce) are uncommon. Several additional strawberry trees have been planted, mostly along the path from the fish hatchery to the tennis courts, to make a special collection: these include Arbutus menziesii, A. xalapensis and A. canariensis , while there are several Irish Strawberry Trees (A. unedo). A Eucalyptus muelleriana was planted by Joan Kirner, then a State government minister, in 1985 to celebrate Victoria's sesquicentenary. The gardens can be considered to be in several zones. From the Town Hall to the tennis courts, along the eastern side, there is an open grassy area, with numerous Dutch Elms (Ulmus x hollandica , common throughout the Gardens) and Cedrus atlantica f. glauca (Blue Atlas Cedar). At the southern end there is an extensive shady pinetum, with a scented layer of pine needles; this has a character unlike the rest of the Gardens. Most of the trees here are Pinus radiata (Monterey Pine). Along the south-western margin, overlooking the river, the Gardens again open up into grass lawn with a mixture of trees including a small group of Giant Redwoods (Sequoiadendron giganteum ) near the old bowling green. There is a shrubbery at the northern end, to the west of the lake, including laurels, Irish Strawberry Trees, Laurestinus (Viburnum tinus ) and an olive (Olea europaea ssp. europaea). Finally, between the lake and the road, is the Lombardy Poplar (Populus nigra ‘ italica ') avenue, prominent in the oldest photographs of the town. A list of all the tree and shrub species present in 1985 can be found by clicking here. Note that many were removed and others have since been added. However, it shows a wide diversity of species among over 300 individual trees.